Yours Clothing was founded nearly 20 years by the owner Andrew. He identified a niche in the market for plus size clothing and since then has continued to sell the most fashionable pieces of clothing, keeping to the cutting edge of the industry. Yours Clothing now has over 70 stores nationwide with stores situated in the Middle East. Yours Clothing has been built on the simple principle of great prices and great quality. Yours Clothing offer a free 10% voucher code if you sign-up to their newsletter. It is a fair trade-off for an email address, if you aren't happy about joining their mailing list after purchasing then we advise you subscribe. However they do produce great newsletters so might be worth staying subscribed. If 10% email discounts aren't your thing, then we recommend you choose one of our own vouchers, they do tend to come with minimum spend caps so be careful of your basket when using the codes. Minimum spend discount codes can go up to 20% discount but might fetch a +£100 spend. Unfortunately Yours Clothing do not currently offer exclusive student discount. Which popular brands do Yours Clothing sell? Yours Clothing is large ‘Plus size’ fashion retailer with over 70 stores nationwide. 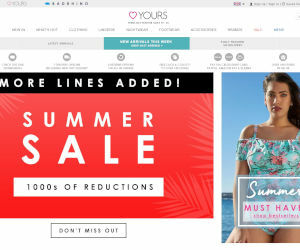 Yours Clothing is one of the largest retailers in the market, with a huge catalogue of clothing, this ranges from dresses, tops and jeans to lingerie, footwear and accessories. Yours Clothing often run minimum spend free delivery voucher codes, we will keep you update on this page with the latest discounts from the retailer.